Lentils are loaded with nutrients, fiber, complex carbohydrates, and folic acld. Lentils are a low calorie, low fat, and cholesterol free food. There are hundreds of varieties of lentils, with as many as fifty or more cultivated for food. They come in a variety of colors, with red, brown, and green being the most popular. Lentils have an earthy, nutty flavor, and some varieties lend a slight peppery touch to the palate. Lentils are also an important source of iron. Eating lentils with foods rich in Vitamin C, such as tomatoes, green peppers, broccoli, and citrus fruits or juices, helps the body absorb iron more efficiently. Lentils are also protein rich. They lack only one protein, methionine. Adding grains, eggs, nuts, seeds, meat, dairy products, or egg will provide a complete protein. Rinse lentils thoroughly under cold running water and drain. Heat butter in a skillet until melted. Add in minced garlic and chopped onion, stirring until soft and fragrant. Add grated carrot, crushed tomatoes and curry powder. Stir briefly. Add in lentils, vegetable bouillon and water to the skillet. Bring to a boil over high heat. Reduce the heat and simmer for 40 minutes or till the lentils are soft. Season with salt and pepper to taste. Serve. The beetroot are eaten boiled either as a cooked vegetable, or cold as a salad with vinaigrette dressing or raw, either alone or combined with any salad vegetable. Beetroot's main benefits are that it contains no fat, very few calories and is a great source of fibre. I too added some left-over Dinkel potstickers, that need using up, to the salad. It might look weird, but really really delicious. Heat the olive and Mazola oils in a skillet. Add in the chopped shallot and sliced garlic. Stir-fry for over medium heat until lightly golden. Stir in the dried rosemary and vinegar, tip in the beetroot wedges, and stir for a few minutes, allowing the flavours to develope. Remove from the heat and leave to cool. Take out the beetroot wedges and put them into a salad dish together with the salad leaves. Pour the vinegar dressing over the beetroot and salad leaves. Toss gently to mix through. Finally, just before serving, toss in the feta cheese cubes and taste for salt and pepper. One of my favorite ways to cook frozen fish is in flavourful rich curry sauce together with some veggies. A delicious dish for any time of the year, but particularly welcome and soothing in the cold winter days with some steamed rice. Rinse and pat fish dry with paper towels. Cut into the 2-inch chunks and place them in a bowl. Add in the marinade and leave it for 10 minutes. Heat a skillet half-filled with cooking oil. Coat lightly the fish fillet with cornstarch and fry them over the medium heat until light golden. Remove and drain. Heat a little of oil in the same skillet over moderately high heat until hot but not smoking. 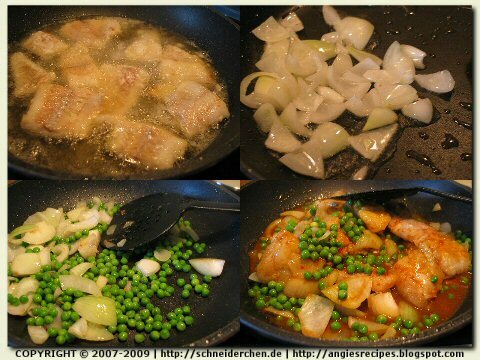 Stir-fry sliced onion until aromatic, add in peas, return the fish to the skillet, pour in sauce and gently stir to combine. Cover and cook for 5 minutes. Dish up and serve with the steamed rice. The delicate, tangy and sophisticated flavours of Belgian endive matches perfectly well with the Feta cheese and walnuts. Belgian endive, also known as French endive and witloof, or white leaf, is a leafy vegetable that looks like a thin cylinder of tight, pale green leaves. The tangy, deep, well-rounded flavor is unmatched by any other endive. Roast the walnuts in the 180C/350F oven for 5-8 minutes. Remove and leave to coll completely. Whisk together the olive oil, vinegar, salt and pepper together in a bowl to make the dressing. Trim off the base of Belgium endive with a knife. Gently remove the 9 outer leaves, one at a time. Rinse leaves and pat dry with paper towel. Cut the remaining endives into the small pieces. Rinse and pat dry. Place in a large bowl with roasted walnut pieces and crumbled cheese. Drizzle the prepared dressing over and toss until blended. Spoon the salad into the endive leaves and arrange them on a serving plate. If there’s any left, then place them in the center of the serving plate. Sprinkle the dried pasley over. Serve with melba toast or crackers if desired. Thank you, Happy Cook@Foodie's Kitchen and PearlYn@A Full Time Housefly for sharing this cool award with me. Thanks! Grate the zest of two lemons, careful that you are grating only the coloured part of the rind. And squeeze the lemon to extract 11 tablespoons of juice. Grease and flour a 32x11 cm loaf pan. Preheat the oven to 180C/350F. Whisk together the flour and baking powder in a bowl. Cream the butter, sugar and pinch of salt with a hand-held beater until light and fluffy. Add in eggs one at a time, alternately mixing in a tablespoon of flour mixture after each addition. Pour in the whipping cream, and then 8 tablespoons of lemon juice and finely grated zest. Fold to combine. Sift in the rest of the flour mixture and gently stir to combine. 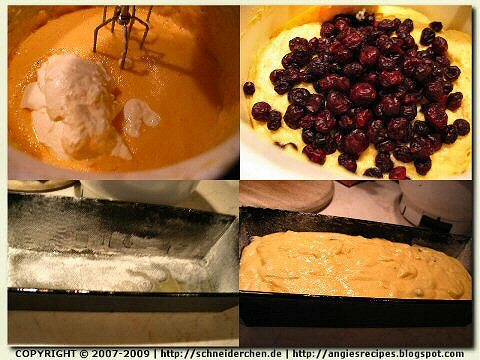 Finally fold the dried cranberries into the batter. Pour the batter into the prepared loaf pan. Place the pan on the lower second rack and bake for about 80-90 minutes. 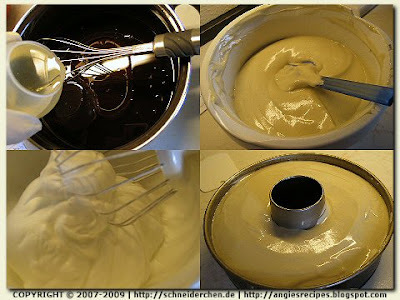 After 35 minutes, cover the cake with a foil greased with butter. Remove and cool the cake in the tin briefly. Then remove the cake from the tin and allow it to cool completely. Sift the powdered sugar in a bowl and add in the rest of lemon juice. Stir to combine. Pour evenly over the cake. Allow the glaze to set before slicing and serving. 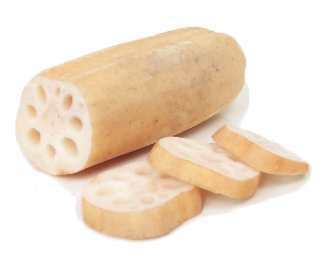 The lotus root is a root vegetable that is indigenous to Asia, and is found underwater. The meat of the lotus root has a texture that is slightly crunchy, and mildly sweet. They can be eaten as fruit, sliced and stir fried, or stuffed with glutinous rice in its flue-shaped holes and steamed as dessert. Tender young lotus roots are good for salads while starchy mature lotus roots are good for making soups. Stir-fried the finely chopped onion with a bit of butter until fragrant. Mince the ginger and lightly beat the egg. Pat the lotus slices dry with kitchen paper towels. Finely chop the chicken breast, add in stir-fried onion, minced ginger, egg, cornstarch, soya sauce, salt and pepper. Stir vigorously in one direction until the mixture has become thick and elastic. To make a sandwich, spread the meat mixture onto each 8 lotus root slices, and cover with the rest of lotus root slices. Lightly coat each lotus root sandwich with cornstarch. To fry, set a large deep pan half filled with oil on medium heat until hot. 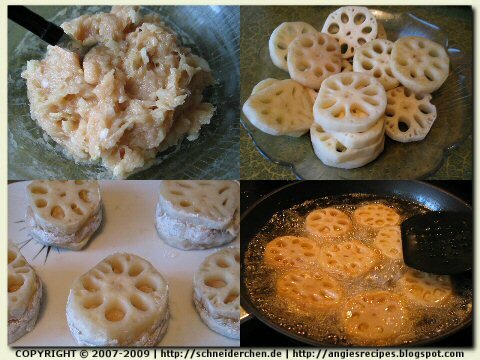 Fry the prepared lotus root sandwiches until both sides lightly golden. Remove, drain and place them in a serving dish. Stir all the ingredients of the sauce in a small saucepan on low heat until it has thickened. Pour the sauce over the lotus root sandwiches. Serve. This strawberry tea chiffon cake has the flavor of refreshing fruit tea and is moist, tender, and light with a fluffy texture. I also used matcha tea powder for this chiffon cake as I wanted to clear up the cupboard. You can use the cake flour instead for the recipe if you have no green tea on hand. Sift flour, matcha tea powder and baking powder together in a mixing bowl. Beat together 20 grams of sugar and strawberry-scented tea until blended and sugar has completely dissolved. Whisk in the salad oil until emulsified. Add in sifted flour mixture and mix until just blended. Add in one whole egg and egg yolks. Combine all the ingredients until you obtain a smooth batter. Beat egg whites with salt and lemon juice over low speed until frothy and foamy. Gradually add in sugar in 3 portions, increase speed and beat until stiff but not dry. Carefully fold 1/3 of egg white mixture into flour mixture to lighten it and then another one third, finally fold the mixture with the remaining whites. Make sure no white streaks remain. Pour into a 26-cm ungreased tube pan and spread evenly. Bake for about 75 minutes until done in the center of 155C/310F oven. Remove pan from oven and immediately turn upside down on the neck of a glass bottle to cool for at least 1 hour. Unmold after it's thoroughly cool. 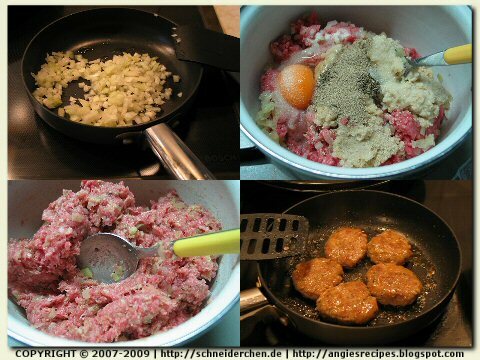 Frikadellen, one of the most popular German meat dishes, are flat, pan-fried patties of ground meat, chopped onions, bread crumbs, herbs, and the seasoning. Frikadellen are like the German equivalent of a hamburger. They are often served with potato salad, or German dumplings, or Sauerkraut. They take a sauce (I like black pepper sauce the most) very well too. A common variant of Frikadellen are prepared with minced chicken. Peel and dice the onions, then saute in oil until transparent. Add sauteed onions to ground meat in a mixing bowl. Stir together breadcrumbs and milk and add to meat mixture. Add egg, basil, salt and pepper and mix well. Dampen hands and form meat mixture into palm-sized patties. Preheat non-stick skillet with a little oil. Pan-fry the meat patties over medium high heat until browned on both sides. Serve them with salad, fries and tzatziki. Alternatively they can be served with German dumplings and black pepper sauce. Glutinous rice, also called sticky rice, or mochi rice, is a type of short-grained Asian rice that is especially sticky when cooked. Glutinous rice does not contain dietary gluten and thus should be safe for gluten-free diets. It is called glutinous in the sense of being glue-like or sticky and not in the sense of containing gluten. Glutinous rice can be used either milled or unmilled (that is, with the bran removed or not removed). Milled rice is white in colour, whereas the bran can give unmilled glutinous rice a purple or black colour. Both black and white glutinous rice can be cooked as grains or ground into flour and cooked as a paste. Stir together the evaporated milk, egg, oil and sugar in a mixing bowl. Sift in glutinous rice flour and baking powder and blend thoroughly. Divide half of the rice batter into 8-10 paper muffin liners, spoon in some poppy fix and add in a few of raisins. Finally cover with the rest of rice batter. Sprinkle with some poppy seeds. Bake in a preheated 190C/375F oven for about 30 minutes. Take out the muffins and brush the tops with a thin layer of oil. Return to the oven and continue to bake for another 10 minutes. Syrian meatballs are made with ground beef (or lamb), rice, carrot, garlic and curry. They are fast and easy to make. The recipe is adopted from Hackfleisch Leckere Rezepte für die ganze Familie. In a mixing bowl, add in the minced beef, cooked carrots, minced garlic, cooked rice, egg, curry powder, salt and pepper to taste. Stir until the mixture is well-blended. Roll the beef-rice mixture into 3cm balls, about 35 balls. Coat each ball evenly with sesame seeds. Heat the oil in a large skillet until hot. Lower in the meatballs, several at a time and fry until cooked through and nicely golden. Remove and drain. Serve them warm with sour cream. May this New Year bring newly found prosperity, love, happiness and delight in your life.